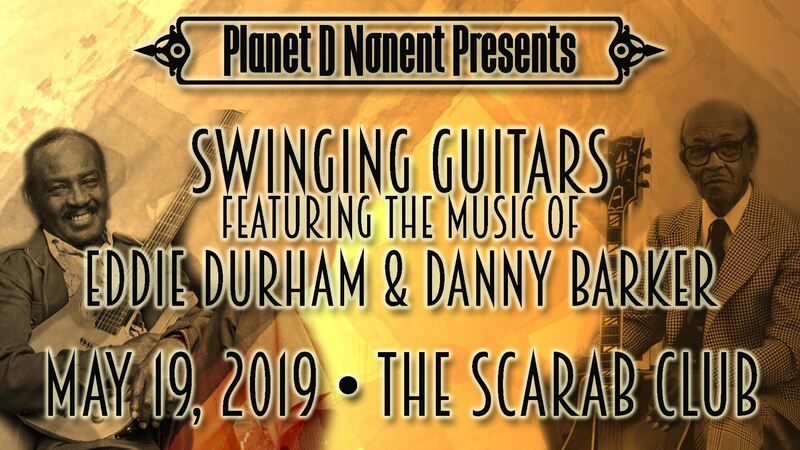 "Swinging Guitars: Eddie Durham & Danny Barker"
This year pay tribute to two guitar players; Eddie Durham, from Texas, the first important jazz soloist on the electric guitar - predating Charlie Christian by a year. And Danny Barker, from New Orleans, a great rhythm guitarist, composer and singer. Eddie was also a great arranger in addition to playing the trombone. These are two unheralded figures in jazz that are perfect for this concert where we shine a light on significant if lesser known artists. We will present two sets of exciting swing music! Danny’s wife Blue Lu will get some attention as well! Born January 13, 1909 New Orleans, Louisiana, U.S. Died March 13, 1994 (aged 85) New Orleans Genres Jazz, blues, zydeco Occupation(s) Musician, vocalist Instruments Vocals, guitar, banjo, ukulele Associated acts Cab Calloway, Blue Lu Barker, Fairview Baptist Church Marching Band. He was an American jazz musician, vocalist, and author from New Orleans. He was a rhythm guitarist for various bands of the day, including Cab Calloway, Lucky Millinder and Benny Carter throughout the 1930s. One of Barker's earliest teachers in New Orleans was fellow banjoist Emanuel Sayles, with whom he recorded. Throughout his career, he played with Jelly Roll Morton, Baby Dodds, James P. Johnson, Sidney Bechet, Mezz Mezzrow, and Red Allen. He also toured and recorded with his wife, singer Blue Lu Barker. From the 1960s, Barker's work with the Fairview Baptist Church Brass Band was pivotal in ensuring the longevity of jazz in New Orleans, producing generations of new talent, including Wynton and Branford Marsalis who played in the band as youths. Singer Blue Lu Barker was born, raised, and buried in New Orleans; her funeral even turned into a popular video broadcast spotlighting the town's jazz funeral traditions. Like many early Louisiana performing artists, claims to her paralyzing influence over the entire country's jazz and blues scenes tend to be made with great regularity. Thus, the tale of Blue Lu Barker is one in which jazz critics on one side of the fence comment on her limited vocal range, while others come up with quotes such as this one, attributed to legendary jazz vocalist Billie Holiday: "Blue Lu Barker was my biggest influence." In both the '30s and '40s she was one of the more popular blues performers, often appearing alongside artists such as Cab Calloway and Jelly Roll Morton. Sometimes it was her husband, musician Danny Barker, who opened the doors to musical groups such as Sidney Bechet's, but no bandleader ever tossed her offstage when she clambered up for a vocal, especially once she started cutting hit records. Barker's most famous recordings were done in 1938. "Don't You Feel My Leg" was a well-crafted song that seemed to encourage promiscuity and restraint simultaneously, always a good thing for the music business. The song got a second round of popularity in the '70s courtesy of Maria Muldaur. The early Barker material features her husband on banjo and guitar and the couple would continue performing together until his death. Her career continued after that, all the way up to a last recording taped live in 1998 at the New Orleans Jazz and Heritage Festival. That's unless the video of her funeral is counted, as her presence is majestic enough to almost be considered a performance. Players who are still alive and jamming at this event include the majestic Big Al Carson on tuba.